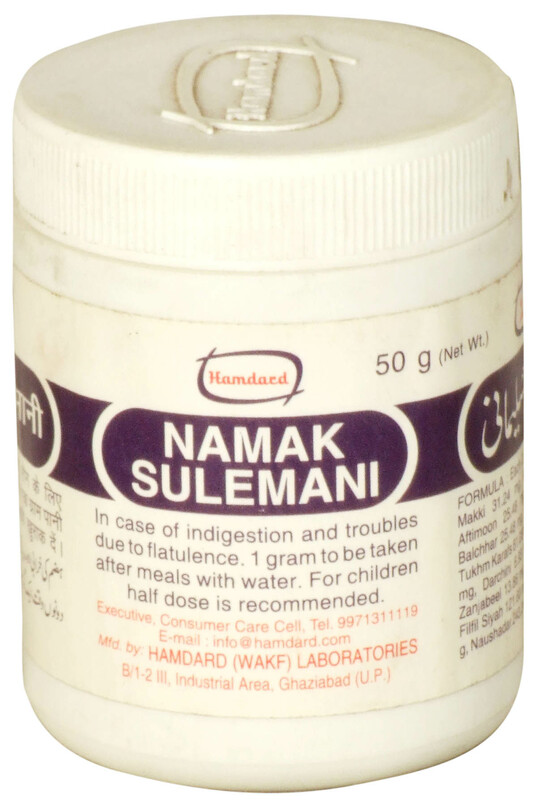 Namak Sulemani: It strengthens the intestines, improves digestion and appetite, releases gas and relieves pain. Direction: To be taken after principal meals. In case of indigestion and troubles due to flatulence. 1 gram to be taken after meals with water. For children half dose is recommended. Formula: Each 2.0 gm, contains: Izkhar Makki 31.24 mg, Asalassoos 13.86 mg, Aftimoon 25.48 mg, Anisoon 13.86 mg, Balchhar 25.48 mg, Tukhm Khas 13.86 mg, Tukhm Karafs 81.08 mg, Habbe Qurtum 13.86 mg, Darchini 6.93 mg, Taj Qalmi 6.3 mg, Zanjabeel 13.86 mg, Zeera Siyah 25.48 mg, Filfil Siyah 121.60 mg, Namak Sambhar 1.44 g, Naushadar 243.24 mg, Heeng 25.48 mg.